This print had the caption above inscribed on the reverse. It looks to me like a salvage logging operation following a fire. Note the steam donkey helping load logs onto the rail cars. I'm not an expert on logging in this era. But I have listened to a lot of oldtimers about how they did things. Here is my guess. This not a salvage logging operation after a fire. No evidence of fire on logs on train. And I think the steam donkey shown was used to yard logs to a landing that train and a small steam donkey could get to and load logs on the train. The mainline and haulback lines from the steam donkey went up to two large blocks on a big spur tree that was topped and then went maybe 1000 ft. out in the woods and the chokers hooked to the mainline were then put on the one species of log they were after. The species of logs they didn't want were knocked over, broken off, etc. Those old donkeys were powerful. When they used horses and oxen for moving logs they just fell the trees they wanted and didn't leave such a mess behind. Today, they still use pwerful diesel yarders, but there is a market for all the trees, so comparatively speaking, there is only a small about of wood waste left on the ground. Mostly limbs and brush. Fascinating description, Buzz. 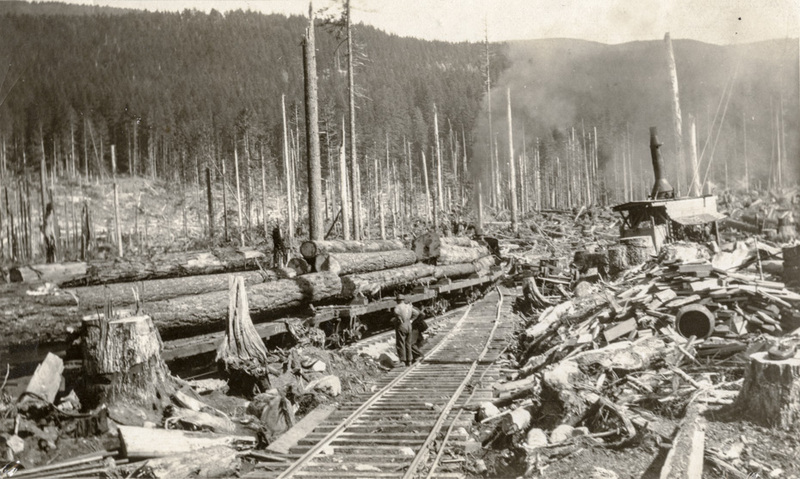 What a great window into logging practices of an earlier era. It seems like these cut over forests would provide lots of fuel for wild fires. On the coast, most of these old logged off clearcuts have grown up again and have been logged 3 or 4 times. Modern sawmills process logs a lot more efficiently and use smaller logs. There is very little waste anymore. It is easy to criticize the oldtimers the way they did things, but it was a different world. Look what happened to the buffalo and salmon in the Columbia. And the farming practices that created the dust bowl years. At least mother nature and different logging practices can cure the devastation to the early forests.. Thanks for the description Buzz. When I was a kid, I can remember driving up the Washougal River to an abandoned logging camp. The mess wasn't this bad, but I remember the old bunk house and cook shack sitting amongst something similar looking. I have read that in the early days logging was horribly inefficient, leaving behind around 50% of the wood. Yes it could create a severe fire hazard, with sparks being sent skyward from wood and coal fired boilers and dry logs being slid over other dry logs creating spots hot enough to smolder and in the right conditions burst into flame. I wonder what future generations will say about some of our "standard" practices. Were tracks laid after they fell trees? Or before? It's a mess all right, but a great deal of the wood in that pile looks like it has been cut and split. The locomotives were steam powered as well as the donkey engine. I'm thinking a good bit of that mess will be consumed by steam boilers before very long.